I’ve been making 5 piece drawers since ‘78. I hate add on fronts. I do have an overarm router and a bunch of jig/fixtures to aid in what I’m trying to accomplish. I even route the groove for the drawer bottoms using my Pin Router. To those that believe sliding dovetails might bind, my thoughts on that are, “It is good that they do end up binding”. With the glue and a little snug fit, binding is very appropriate. Below is a picture of a jig Jbay posted. What I don’t see is an indexing stop for the drawer front edge. Easy enough after you get the distance from the edge of the drawer front to the outside edge of the drawer side. Do one side only on all fronts, and when done, set up the block at the same distance for the other side. Rout all, then route the bottom groove. Another thing not shown and needed on the jig is something to hold the front securely while routing the dovetails. De Sta Co is a manufacturer of Toggle Clamps??. I’ve only known them as De Sta Co clamps, but I see them in woodworking links and books. Easily available. The stop you were asking about to keep you from punching out the top edge is shown in the picture. After making a jig like this, and you find you want a shorter dovetail, just cut some pieces of wood to take up the additional stop. If you find you didn’t allow for enough dovetail length, remove the larger stop and cut it narrower and reinsert. there are a couple other ways of doing the dovetail lengths, but I’m tooo slow at typing to try explaining it. If you go the route of using this jig, you will discover it’s a pretty good set up. 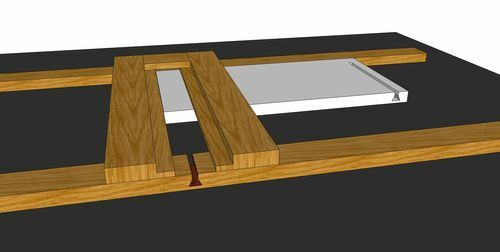 You could easily make a router sled that your router slides on, and move your front from side to side.